Had my tv for 20 years had NO PROBLEMS until 2 weeks ago. Turned it off 2 hrs later it would turn back on. I think I got my uses out of it. If I could find another one I would buy it in a heartbeat. Picture quality and ease of use and setup. This has been my first big screen tv and it has worked great. Very good customer support with hooking up my receiver, dvd, tivo, VCR. Best picture quality when viewed from front, side view is a little blurry. this was my first RPTV it has a good picture and was a good deal at the time of purchase. but the quality of new hdtv's is tempting. 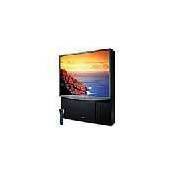 i am currently looking at toshiba and mitsubishi hdtv ready tvs. and now cannot get the TV to work with new parts so they must try to find other bad components. Original factory warranty will be up now in about three months. My suggestion before you invest in any large screen TV find out what trouble they have been having with the model you are looking at. Ask your service people in your area can they repair and get parts if necessary. I am currently using my old JVC 25" which is 15 years old with a great picture and seems to keep going and going. For the large price you will pay for the big screen tv's if it breaks down every day it is not in service is money out the door. faulty but not many manufacturer's will refund your money when the warranty period is up. Will consider buying RCA again just for this reason. Ive had this TV for 3 years now, and Ive had only one problem with it. But since we had an extended service contract with it, that wasnt a problem. The picture screen started showing what looked like stains dripping down from the top. Over a period of a few weeks they appeared to be getting bigger. Called the service technicians and they repaired the screen with a new part in the house. Havent had a problem since. But the picture quaility has been excellent for a projection TV, works remarkedly well with a DVD player as far as video quality. Audio quality is not as good for DVD players because of the lack of a digital audio receiver to play through. The Enhanced SRS channel tends to drown out any dialog and enhance all music and sound effects on digitally enhanced recordings. But that is the drawback of trying to push 5 or 6 channels of sound through a 2 channel sound receiver (i.e. the TV). But all in all this has been a great purchase. I got it as a surprise Christmas gift from my wife 3 years ago, and I was astounded with it. I know for the price she paid for it then, we could have gotten a nice HDTV big screen now, but I am still pleased with this model. And we I plan to retain this unit for as long as possible until we are forced to upgrade to HDTV. Who knows maybe by then there will be an adapter unit that will work on standard TVs, so we wont all have to go out and buy a new console designed for HDTV. But I will wait till then at any rate, or until this model quits on us. Only 4:3, lack of some standard controls, lack of fancy tube adjustment. This is my first TV larger than 30", and I have been absolutely delighted. The image quality is terrific, and when the volume is turned up using one of the stereo enhanced modes, there is no distortion. I am going to be building my home theater system further this year, but I have been using this TV for more than a year now and believe that I made the best choice. For $1999, the digital comb filter technology was a plus on this system, and whenever anybody sees this TV they are really surprised at the quality. Side viewing is "ok", but not that impressive. I have a large family room and the best spot is still the part of the couch right in front of the TV. It is better than a lot of the models I looked at in the showroom, but if you plan to watch from an angle all of the time, check the viewing angles yourself. There are enough Svideo inputs and RCA inputs if you do not have a Reciever, and there is a handy little front panel for a quick video cameral hookup. It has been handling my satellite receiver, DVD and VCR very nicely, and switching modes on the TV to select which device I am using is a cinch. There are more features which I do not use, such as the guide+ and the PIP (which can not be used with the sattelits) - although I can use the PIP for satellite/DVD reception, but it is not all that useful. I have seen some more advanced tuning of the tubes on other TVs, but I have only run this system through the picture adjustement because I thought it would be reasonable to do periodically. This TV has been rock solid and I am glad that I made the purchase. Don't bother trying to buy this over the Internet. Believe it or not, I got it at the Wiz and could not find a better price online...even if I did, the thing weighs too much to ship, anyway.